2 editions of Threats to the peaceful observance of the bicentennial found in the catalog. Add another edition? Are you sure you want to remove Threats to the peaceful observance of the bicentennial from your list? 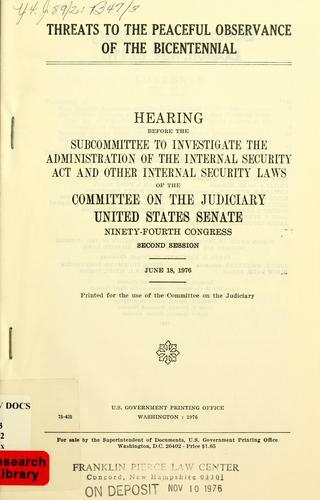 hearing before the Subcommittee to Investigate the Administration of the Internal Security Act and Other Internal Security Laws of the Committee on the Judiciary, United States Senate, Ninety-fourth Congress, second session, June 18, 1976. 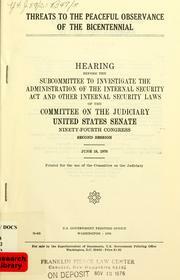 Published 1976 by U.S. Govt. Print. Off. in Washington .